Living not too far from an Ikea, I know there are many who have a love for the Swedish furniture store. I have friends who can spend half a day wandering the showrooms, mock living spaces filled with modern and inexpensive, assemble-it-yourself furniture that entice you into redecorating your own home. In One Mixed-Up Night, Frankie and Walter, sixth graders and best friends, have an obsession with Ikea. For fun, they play the "picking game" with the Ikea catalog, in which they pick the thing from each page they most want. They've only gotten to visit the store itself a few times in their lives. When their families are planning a visit to Ikea together, Frankie and Walter come up with a plan inspired by the book, From the Mixed-Up Files of Mrs. Basil E. Frankenweiler. Instead of spending the night at an art museum, they decide to spend the night at Ikea. They tell their parents they are sleeping at each other's houses and they have a night of adventure in the furniture store, jumping in pillow mountains, eating Swedish cake, and zip lining across the warehouse. Children will be enchanted with Frankie and Walter's adventure as they find ways to entertain themselves in an empty store, alone, after-hours. Frankie and Walter's Ikea night is about more than a fun adventure. Frankie thinks a night at Ikea will bring back the brightness Walter seems to be losing. Throughout the night, Frankie and Walter share memories and the reason for the changes in Walter is revealed. The book explores loss and the emotions associated with it. Two friends learn the power of friendship and love in helping with the healing process. 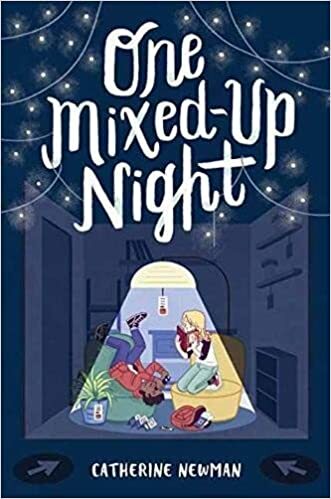 One Mixed-Up Night is the author's first book written for children. The book, published by Random House Books for Young Readers, will be available in September. Thank you to the publisher for providing my #BookExcursion group with a copy of the book. I'm looking forward to recommending the book to students at my school this year!